Durable, reusable packaging plays a significant role in agricultural operations. Reusables offer superior product protection and ease of handling in the field, as well as other important benefits such as increased productivity, ergonomics, and tracking capabilities. Intermediate bulk containers (IBCs), including foldable bulk bins, and handheld crates are commonly used in harvest operations while other reusable packaging options are available for seeding and processing. The use of plastic reusables in the agricultural sector goes back to at least the 1980s. Before that time, the industry relied on products such as plywood orchard bins and harvest crates. Reusable packaging is available to enhance the food supply chain at every stage of operations, including seeding, harvest, and processing. 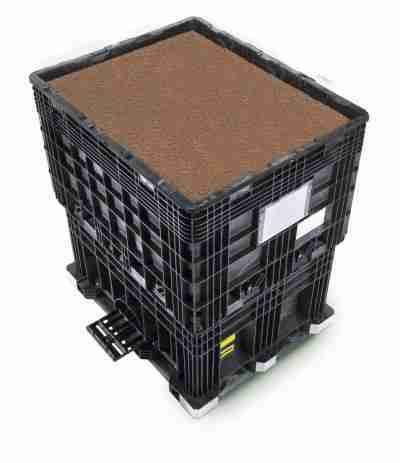 Buckhorn, for example, offers its CenterFlow seed boxes, a bulk, reusable alternative to super sacks and wood pallets. For harvest operations, handheld containers, bulk boxes, and plastic pallets replace other items such as large polyethylene bags or wood pallets. Reusable packaging delivers substantial benefits in food processing as well. 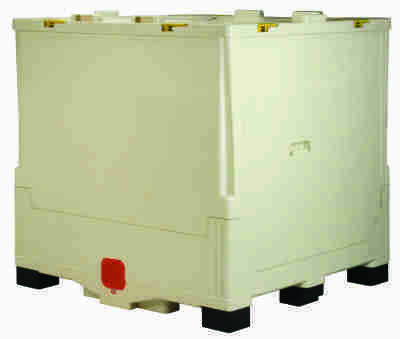 Suppliers offer a selection of IBCs made of FDA-approved materials. These containers are collapsible and are available in a top or bottom discharge configuration for different food, liquid, and semi-liquid applications. Reusable packaging now often addresses extended supply chain applications versus being restricted to the farm or processing facility. For example, Buckhorn’s Caliber IBC is certified for rail transport. Buckhorn’s experience in returnable containers such as bakery trays and distribution totes allowed it to branch out in the 1980’s to handheld containers for fruit and vegetable harvesting. The containers held crops such as mushrooms, asparagus, lettuce, strawberries, and grapes. Eventually, this led to a bulk container for cranberries. For Buckhorn, its increasing experience with bulk containers in the 1990’s transitioned well to its first seed box, which was a modification of an existing bulk container. Later that decade, Buckhorn worked with a leading seed manufacturer to design and introduce its popular CenterFlow container. Within the food processing sector, one area of early interest was the design of handheld totes for quick chill operations and transport of pre-packaged meat, poultry, and seafood. In the 1980’s, Buckhorn developed the NestPac container for shipment of chicken to a major fast food restaurant. The growth of interest in the bulk handling of liquid and solid foods over the last decade has led to continued refinement of IBCs by Buckhorn and other leading providers. There are a variety of reasons why reusable containers are essential to agricultural operations, according to insiders. 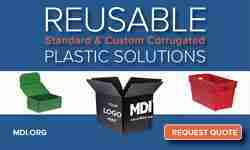 Correctly specified reusable containers are safer than alternatives. They offer secure stacking and eliminate problems from splinters, nails and dust from operations. They also have smooth walls making the containers easier to clean. 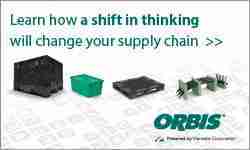 And of course, reusable packaging also provides cost savings over time by providing a lower cost-per-use. Ultimately, reusable packaging is a sustainable solution that can deliver a quick return on the customer’s initial investment. Two dominant trends are taking hold in the agricultural market. First is food safety with the FDA’s Food Safety Modernization Act taking effect in 2015 and 2016. The Act regulates the way food is grown, harvested and processed with the primary goal to prevent contamination. This requirement is inspiring customers to find a cleaner, tamper evident approach to how they handle and store food. Buckhorn notes that it is also witnessing a desire for customers to consolidate their operations and become more efficient. Such improvements include reducing packaging steps from farm to retail. Another emerging trend to watch is the ag tech explosion. While food safety concerns are driving interest in advanced tracking technologies in reusable packaging, ag tech initiatives might also help further push such technologies to the forefront. “The ability to implement IML or RFID labeling on plastic crates gives them a unique identification, allowing products to be tracked, a huge advantage for growers,” states Poran. Innovation is ongoing regarding services and products. In January 2016, Buckhorn announced the launch of Buckhorn Services, which provides a mobile washing service for seed manufacturers, allowing them to focus on their core business. Buckhorn Services can wash units in a matter of days which would otherwise take weeks or months. After arrival, the washing unit is backed up to one of two adjacent dock doors. Buckhorn sets up a conveyor, so as boxes proceed through the washing unit, they re-enter through the adjoining door. Set up and tear down is quickly managed by Buckhorn Services’ on-site team. 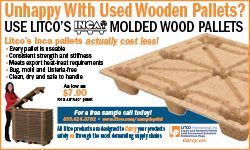 While handheld crates are a mature application, innovations continue to take place. For example, after a cross-functional and collaborative supply chain development process, Plasgad launched its Picker Crate in 2016. 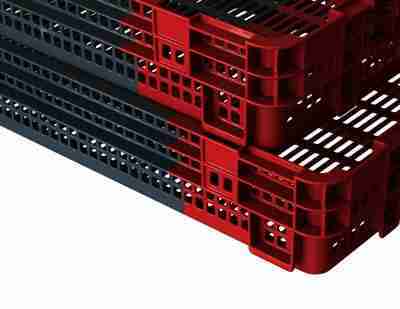 A key feature of the Picker Crate is that it operates in two working modes – stacked or nested, identifiable by color. It is also designed to offer maximum ventilation in both modes, locking mechanism for column stability, and a full match with existing versions and others. The main thing to remember is that not all containers are created equal. Customer evaluation should consider the quality of the materials used, wall thickness, durability, and after-sale service when implementing a reusable packaging program.